Native Americans represent just one per cent of the US population and some languages have only one speaker left. Now a new generation is fighting to preserve the culture. 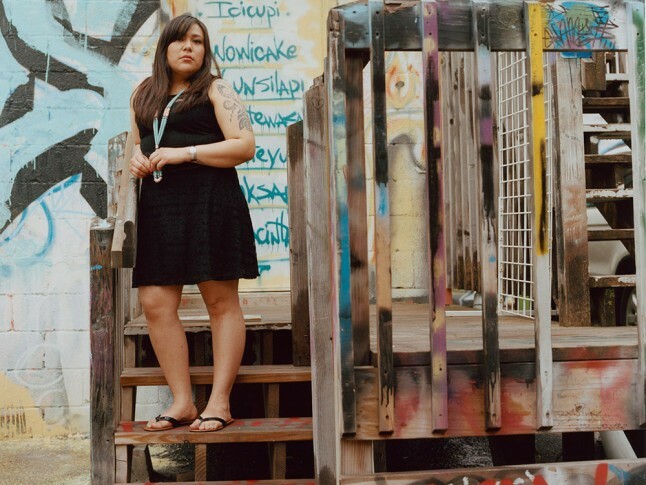 When Evereta entered college as the only Native American in her English 101 class, it was at that moment she realized that she needed to speak up and not be that stereotypical ‘shy’ Indian that keeps to herself. She started bywriting an essay in that very class about living in ‘two worlds’; living in the traditional world and living in the modern world and how Native Americans need to find that balance in today’s society. ‘Knowing who you are as a Native, know the teachings from your elders and engraining them as you go out into the modern world is how you maintain that balance’. She further explains that ‘once the language fades, the culture will slowly start to go too. 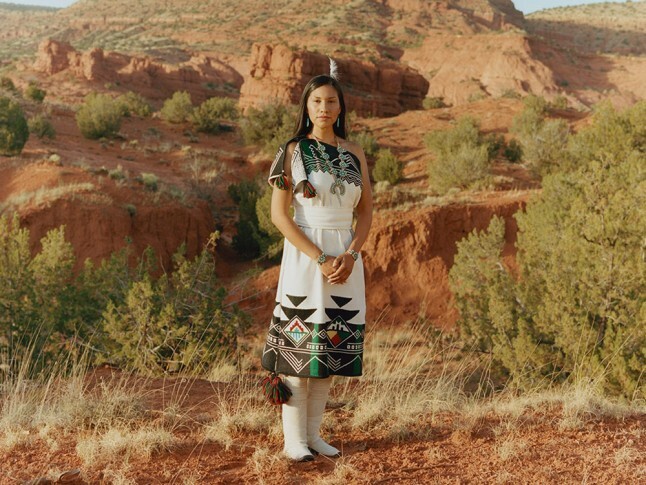 If the younger generations cannot speak the language, how will they be equipped to make decisions on policies and protect our tribes in the future?’ She aspires to start a language and cultural immersion school for the Diné (Navajo) people. Alayna currently holds a seat in the National Native Youth Cabinet under the National Congress of American Indians (CNAI). Three key issues that she addresses on behalf of the Native youth population are the importance of language and culture, bullying, and lack of education. Her passion to keep the language alive stems from her father being one of the few fluent Lakota speakers. He chose not to speak it to her as a child, but as she grew older, she understood the importance of keeping the language alive. ‘Speaking your language is a guide to knowing who you are as a Native’, says Alayna. Growing up, Shawn was severely shy and timid. It wasn’t until after graduating high school that she was urged by a musician friend to be featured in one of his songs. This was a freeing moment for her and a new outlet to express herself. She began to write poetry and join local talent shows. While holding a work position at a teen group home, Shawn encouraged the teens to keep a journal and write how they felt. Most of what the teens wrote was poetry and songs so Shawn began a poetry workshop that led to an open mic at the group home. She decided to expand her efforts and encourage others to speak freely at local events and pow wows. Rez Poetry: ‘Wičhóiye Wašaka’ (Strong Words) was the name she coined for her events. ‘That’s what I want to do, empower other Natives, especially the younger generations’. Sage earned the title of 1st attendant in the 2012 annual pageant, Miss Native American USA. From that point forward, she has been encouraging Native youth to travel off the reservation to explore opportunities. In Native American culture, knowledge is power and the youth are encouraged to leave the reservations, get an education and then come home to give back to your people. ‘My tribe, the Hualapai people, is so small that I want to be a role model to show my community and youth that it is possible to come off our land and do big things’. Juliana and her husband, Scotti Clifford, have formed the band, ‘Scatter Their Own’ (which is the English translation for the word Oglala). 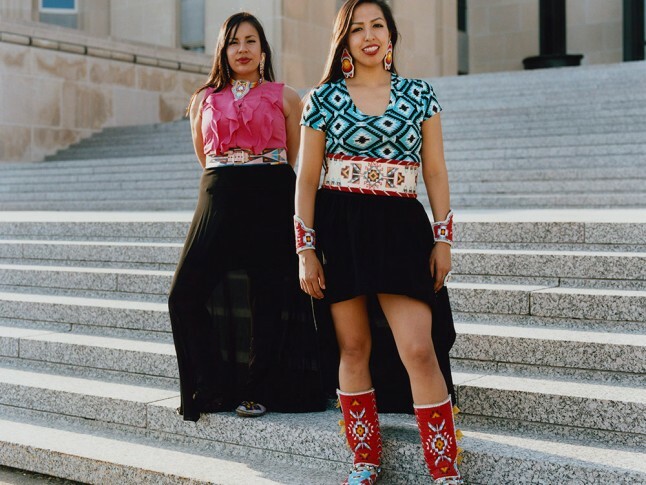 They travel to various Indian reservations and other parts of the country to play their music. They are self-taught, cannot read music and play what comes out naturally from their hearts. Juliana is inspired to play for the youth and inspire them to branch out and learn about the arts and music which are topics not generally exposed on the reservation. 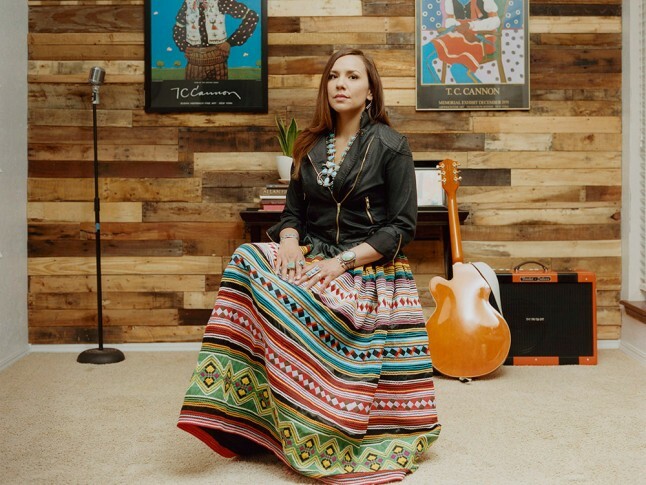 The songs they write are about Mother Earth, social justice and about the Native American culture. As the daughter the internationally recognized Native American artist and former Chief of the Seminole Nation, Enoch Kelly Haney, it’s no shock that artistic and bold talent radiate from the ever-inspiring Kelli Brooke. In the early 2000s she formed a rockabilly band with her best friend called The Oh Johnny! Girls and also has a solo music project called Hudson Roar. Kelli grew up in a household where her parents spoke Seminole Creek as the first language. She is also the mother to a sweet five-year old boy, Jack, and expresses the importance of raising him with Native American traditions as well as encouraging him to embrace his own artistic talents. Growing up, Juanita was valedictorian of her charter school, President of the Native American Youth Empowerment (NAYE) group, and on the executive committee of UNITY (United National Indian Tribal Youth Organization). During college things changed dramatically for Juanita. She felt the pressure of life and quickly fell into depression, anxiety and succumbed to drugs and alcohol after dealing with a very traumatizing family event. ‘It was the worst time of my life; I really thought I was going to die and I wanted to die’. In 2012, she had a turning point. ‘I started to believe in my dreams and in myself again.’ She ran for Miss Indian World, one of the most prestigious honours a Native American woman could receive. Although she didn’t take the title, her tribal community was extremely proud of her representation. Today, she works for the Community Wellness program on her reservation and has truly influenced positive changes in the program and in her community. See more images and read the full story in the September issue of Marie Claire. This entry was posted in Arts & Entertainment, Top Story and tagged culture, Native American women, preservation by Kim Kalliber. Bookmark the permalink.